As a parent and a teacher, I vacillate between a bookworm nerd and a tree hugging hippie on a good day. I want my children to excel in everything, but also be well-rounded enough that they can sit in the woods and never tire of the view. It's a balance, I suppose. Before I started homeschooling, the idea of learning Latin seemed too much, even for my nerdy side. However, last year when we reviewed one of Memoria Press' Spelling programs, I was introduced to their Latin program and how perfectly normal parents were diving headlong into it! With a little digging I found out some interesting information that made me jump at the chance to review Prima Latina: An Introduction Christian Latin. The idea of learning Latin always seemed like something you do in a boarding school or college, but Memoria Press' approach is designed for any age and begins as young as 1st - 4th grade elementary students. Proponents of learning Latin are quick to point out the many English words rooted in Latin as well as the many professions where a knowledge of Latin is extremely useful, if not required. As my kids enter the realms of literature and history, a good appreciation of the Roman Empire and language would be such a blessing. Prima Latina is the introductory level of Latin. We received the complete set which includes a Teacher's Manual, a Student Book, DVDs of video lessons, a Pronunciation CD, and a set of flash cards. The design of the program is for parents/teachers completely new to Latin so there is no prior experience needed. The video lessons walk student and teacher through each lesson The Teacher's Manual provides the Student Book view with answers printed in as well as a Vocabulary Index, Teaching Guidelines, reproducible drills, tests and answer keys in the back. My son (8) is the one who used the workbook, but my daughter (5) tagged along especially for the videos. At first I attempted to do one lesson at a time or somehow make it consistent, but it quickly became a source of contention. Some days we could do several pages, other days (depending on where it fell) one page was more than anyone could handle. So my approach became one of compromise. Every time we sat down, I would set a goal of getting to a particular page or section and that worked pretty well. After we got the hang of things, I could turn on the video and go attend other things for a short while. For my learning and their comprehension it works better if I have heard/seen what they have, but for students who are engaged and able to work independently, it does not mandate full supervision. Depending on my (almost) 2 year old, I would pop in and out, giving help where needed. While there is time built in to the videos for writing answers in the Student Book, my son would sometimes miss things so we would sit down afterwards and go over those to complete it. The Pronunciation CD and flashcards are not required to complete the Student Book, but extremely helpful in reinforcing the concepts presented in the videos. The CD includes a pronunciation guide, prayers, and songs that provide a full picture of the language and is a great refresher anytime. I like being able to put the CD on - even when we're not focusing on Latin - to get the words and pronunciations into their minds even when they aren't thinking about it. The flashcards are fun to just give the kids and let them test each other. The flashcards contain all the Latin words learned in Prima Latina, but also words in the next level, Latina Christiana so they are a good lasting resource. Memoria Press does a really good job of teaching through all of the learning styles and engaging multiple senses. As long as we didn't always do a ton of pages, the kids never really complained and were happy to tell Mr. Butler the words they learned at the dinner table. I appreciate that it introduces/reinforces grammar in the midst of all the vocabulary, in addition to the many opportunities for reinforcement. There are naysayers out there that consider learning Latin a fool's errand, but I tend to reside somewhere in the middle. I can see how one can become a productive fruitful human being without it, but I also can see how it can bring a deeper perspective to so many things while exercising mental acuity as well. Learning it in this manner (in conjunction with grammar and with audio/video elements) while they are young just makes it so easy that I'm definitely a big fan! 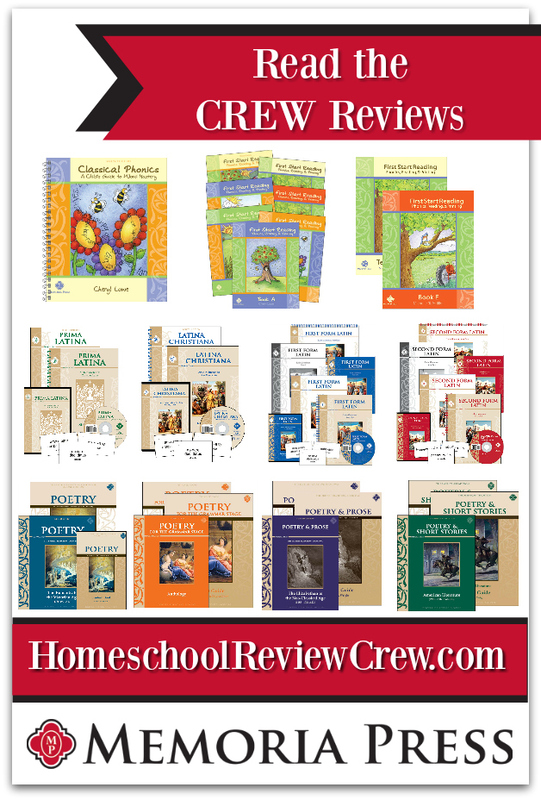 The Homeschool Review Crew tried out several other products including all levels of their Latin program, First Start Reading, and several Poetry books. Don't forget to read some of their reviews through the link below to get a well-rounded perspective on Latin or some of these other products!